I’ve run out of gas while driving on the open road exactly 6 times in the 26 years that I’ve had a driver’s license. When I was a teenager, I purposely left food on the plates that I’d wash just so my parents would lose faith in my ability to clean and I’d no longer be expected to do dishes. I’ve never been on time for anything in my life. I was even ten minutes late for my own wedding. While I’m at it, I might as well confess that I once drained half a can of warm Diet Coke into a houseplant before tossing it into the recycling bin because I was just too lazy to trudge all the way to the other side of the kitchen to empty it into the sink. My point? I’m not a good person. I’m just not. I’m irresponsible, and most of the time I’m far too lazy than what is deemed socially acceptable. It’s true, I’m a real catch. Everybody says so. Add to all those impressive characteristics the fact that I’ve never had a fondness for any living creature that cannot be labeled a homo-sapien, and it’s no surprise whatsoever that I would definitely not make a great pet owner. The idea that the only real pet my son has ever, and most likely will ever know (at least while he lives at home) was a red Beta fish named Ralph, makes me sad…..but not sad enough to ever want another pet. It used to simultaneously rip my heart to shreds and make me laugh so hard I couldn’t breathe when I’d overhear him talking to Ralph about the ending of a book he’d just finished or excitedly showing off a new toy and explaining how it worked. Last April we had an ant problem in our house, and for some reason, God love them, the darn things always ended up floating upside down in Ralph’s tank. They would climb the cord of the filter and then fall to their doom and drown in the water. After placing just under three million ant traps around the house, it didn’t take long for our apparent infestation to come to an end, but to me that made no difference. I was still uneasy about how many had been found in that tank, so more often than not, each night before getting ready for bed, I’d check the fish tank to make sure it was clear. On one particular night, I breathed my regular sigh of relief that there was no sign of the disgusting little creatures, and started to walk out of the room. However, as I made my retreat, I suddenly had a weird feeling that something wasn’t quite right, so I turned around and checked the tank again. That’s when I realized that not only were there no ants…there was no Ralph either. Trying not be be alarmed, but never having dealt with a missing fish, I surveyed that tank somewhat frantically from every God forsaken angle. I poked behind the rocks to see if he’d somehow gotten crushed, shifted the plastic plants to make sure he hadn’t become tangled up somehow, and all but broke my neck in a desperate attempt to angle my head in just the right way so I could get a good look under the filter. The bottom line? Ralph was nowhere to be found. At the time of this unexpected discovery, my son was in the shower and my husband was having dinner with friends, so I was alone and desperate. I couldn’t imagine having to tell Owen that Ralph had “somehow disappeared” especially since there was absolutely no question that I would be the prime suspect in the fish napping. Unfortunately, it had only been a matter of days since I’d been overheard complaining that Ralph made my skin crawl. Come on, what was I supposed to say after accidentally catching a glimpse of this humongous gap in his side that should have appeared on Ripley’s Believe it or Not! for looking like the world’s most gigantic paper cut whenever he moved his fins? It was seriously grotesque. To make matters worse, Beta fish have these disturbing beady little eyes that I may or may not have pointed out in a moment of rage one evening when I was 100% sure Ralph was staring at me on purpose from inside his tank. I will never be convinced it was a just a coincidence that every time my son or husband put their faces up to the tank, Ralph hightailed (highfinned?) away and darted behind some plastic shrubbery, but the few times I was alone in the room with him just minding my own business while getting ready to feed him some vile smelling fish flakes, I’d put my face up against the glass and he’d float there defiantly in place glaring back at me. During my most recent run in with him, he’d actually sneered (well…bobbed frantically) as if to say, “You’d better sleep with one eye open, Sister.” If I didn’t know better, I’d swear that fish squinted his beady black eyes, tossed his head back, and let loose an evil gurgle in a moment of sheer triumph as I shrieked in horror and sprinted from the room. 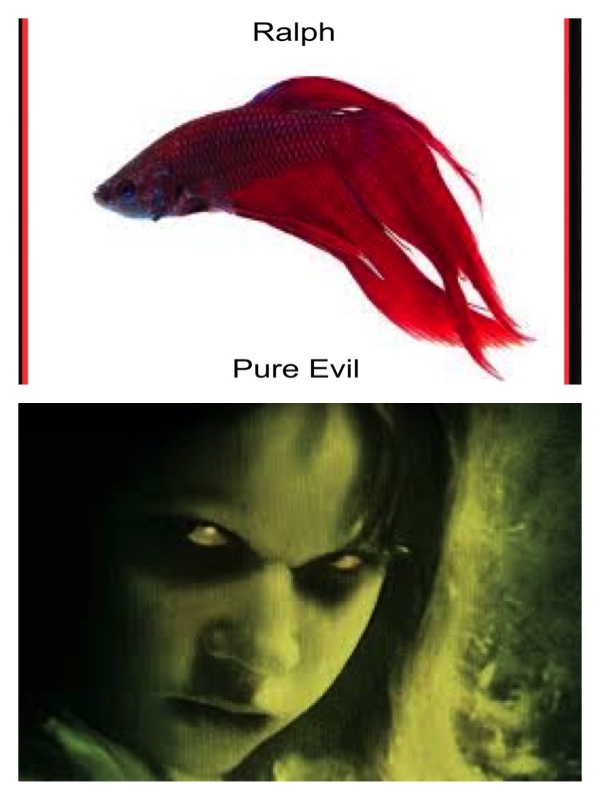 The terrifying image of that fish lurking in its tank at that moment is rivaled only by the image of a possessed Linda Blair at the height of her exorcism. Yes. It was just that traumatic. Nevertheless, despite being terrorized by the darn thing on a regular basis (okay, three times), I would never have harmed a hair on Ralph’s little…fin, I just wouldn’t. Knowing that I couldn’t break the news that Ralph was missing to my son all by myself because he would be just absolutely devastated, I decided I was going to have to be the drama queen wife and summon my husband home from his night of revelry with friends. However, before I made the call to request assistance in the crisis at hand, I wanted to do one last check of the tank to make sure that Ralph was really truly gone. Thinking that the big dark blob on the floor near the fish tank was some giant beetle that had come to finish me off, I prepared for battle and raised my foot to stomp on it, but for whatever reason, I gathered my wits together before I did so, and realized that what my foot was about to clamp down on was, in fact, the shriveled remains of Ralph. I was absolutely horrified. Since then I’ve discovered that Beta fish like to jump….and that appears to be what Ralph did. He plunged to his death and landed right beside Owen’s Lego mini-figure leprechaun. You can’t imagine how wretched it makes me feel to imagine Ralph passing away while staring into the eyes of a yellow faced leprechaun (beady eyes staring into beady eyes) right there in the middle of the floor. As luck would have it, however (maybe it was the leprechaun? ), as I was frantically trying to figure out what to do, I heard my husband pull into the driveway just as my son was finishing up his shower. I was able to fill him in on what had happened, and within just a few minutes we were having a family meeting on the living room couch. Family meetings are reserved for only the most serious of conversations, so when my son sat down looking concerned and worried, my nose started to run and my own tears began to flow. Knowing that we were about to break his little heart and share the death of his first pet with him just absolutely destroyed me. I was so upset that I honestly couldn’t speak, so my husband ended up having to deliver the news that Ralph was no longer with us because he had somehow managed to jump out of the tank. I think it was at that moment that he first realized I was crying, and in a move that I will honestly remember as one of the most tender moments of my life, my nine year old little boy leaned over, smiled into my eyes, tapped me gently on the knee, and then whispered “It’s okay, Mom. Ralph had a great run,” into my ear. Perhaps I’ve watched too many Hallmark movies, but in the ten minutes between discovering Ralph and breaking the news to Owen, I’d imagined comforting him as he howled into my arms, rocking him back and forth deep into the night, and holding cold compresses to his head after the wave of hysteria passed, all the while convincing him that yes, he would need to go to school the next day because life, after all, had to go on. Instead, he was pretty much telling me to get a grip. I simply could not believe it. Oh, yes. Good times. Nothing cures a moment of despair like a little bathroom humor. In retrospect, I’m certainly glad my son wasn’t devastated beyond repair by the death of his fish. After all, he’s a little boy and he’ll have the rest of his life to have to deal with disappointment and loss. And while I can’t promise that I won’t ever run out of gas again in my life, and I most definitely can’t promise that I won’t ever be late for another appointment, I can make the promise that I will always be there to help him get through those moments when they do come around. Since that evening last spring, Owen has never, not even once, asked to get another pet of any kind. The fish tank sits empty, but still in place, and should he ever want another one, we will certainly make that happen. For now, however, it would seem that he’s pretty content just…remembering Ralph.